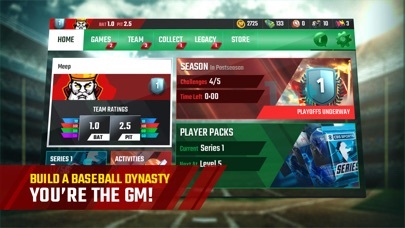 Baseball season is in full swing and the most popular mobile baseball management game is completely updated! Take the field and put together a lineup of All-Stars and Hall-of-Famers. Play Every Day Swing for the fences every single day. Play 45-game seasons, exhibition series, pro series and showdowns! Earn rewards and draft packs through daily game play and use those resources to continue to build your ball club. Build a Champion Manage your lineups and build your team into a championship contender. 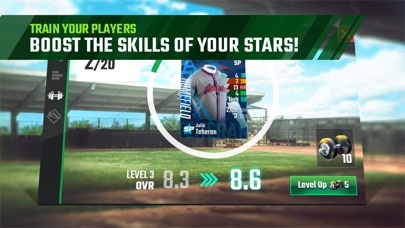 Put together a ball club of aces and sluggers, customize your game plan, play seasons and bring home the championship trophies! 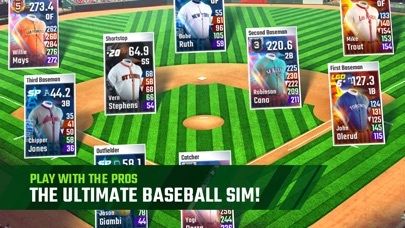 Build the Ultimate Lineup Unwrap packs and fill your lineup with the biggest names in MLB history. 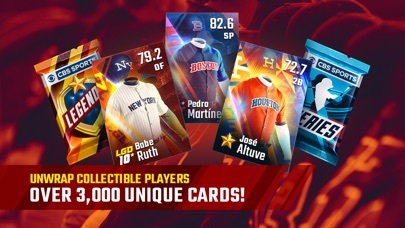 Collect Special Edition, Limited Edition and Legend versions of your favorite players to unlock their Ultimate Players – the highest rated baseball players in mobile gaming! 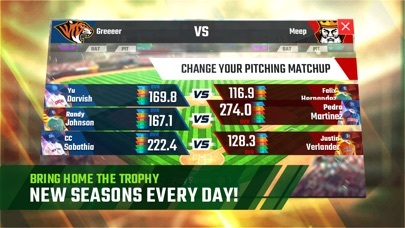 Step into the batter’s box and play the mobile baseball game that always brings home the pennant! Started out good, but I’m in my first season and the playoffs aren’t working. I know. I have the football version and it runs fine. I’d use the in-app contact, but that just closes the game. Admin, you need to fix this. Good game! Thanks for the great app. I assume the player image of the catcher for the game’s cover is Benny DiStefano. He’s the last left handed catcher to play a game in the MLB and that was thirty years ago. I would have used Mike Trout for my cover but to each his own. I really enjoy this game. It’s fun to pass the time. Its not complicated, easy to read and understand. It’s not really something you can play all day because everything is on a timer which restarts every 24 hours. You will probably only check the game once a day and then not have anything to do until the timer resets. But it’s a lot of fun to build your team and slowly go through each level and series and watch your team grow and get stronger.... My only complaint... The developers make a new game every year and non of your progress transfers. I played the 2016 & 2017 app games and had to completely start over each time. And here I am starting all over for 2018. This is the last time for me. Even if they make a 2019, and they will, I’ll just stick with this one. So if the developers are reading this: PLEASE! Make a game where we can transfer all our progress. Please keep in mine some of us do spend money on games and it’s frustrating all of that is lost each season.